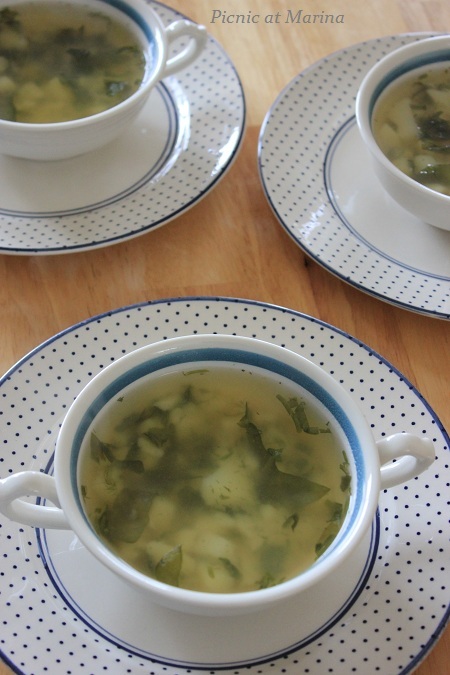 Occasionally, I make a hot water soup too, although my hot water soup has a little bit more than just hot water, and it is my husband's favorite soup to have in the winter: the colder it gets, more often he asks for it! 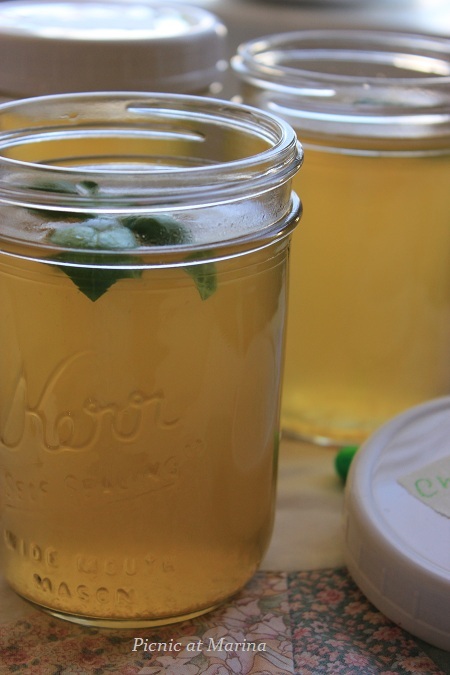 Often times just plain chicken broth (a.k.a. hot water soup) and a toast is all he wants. Sometimes I get "creative" and add a potato and a carrot with some herbs to it. But whether you add "extras" to it or not, the good chicken broth is a meal on it's own. It takes some time to make a good stock, but it is just time, not a work as you let it slowly cook for several hours (6-8, even 10-12), then leave overnight in the refrigerator. The next day you'll be praised with flavor of the most delicious chicken broth. Needless to say, but I'll say it anyway, a good stock starts with good ingredients, in this case a good natural chicken. A few years back we did experiment with a few chickens: one store bought natural (#1), another one was organic (#2), and a third was from a local farmer (#3), who was selling his free range chickens (for this one I had to be on a waiting list!). I made three stocks, using the same ingredients (except chickens), same cooking time. And can you guess which stock was the most popular and was gone before it even cooled down? If you picked #3, you were absolutely right. The color and rich flavor of the stock was amazing. The runner up was #1, made from natural store bought chicken (from Whole Foods): it's flavor was milder, yet it had good body. Chicken stock made of organic chicken was too plain to our tastes even with all the vegetables and herbs used, however it was still much better than the one you get from a box or a can. Waaay better, and worth all the effort. Place chicken carcasses in a big stock pot, add water and bring it to a simmer (do not let it boil! ), skim all the foam (scum) from the top (it will take you about 40-60 minutes, be patient). You do not have to stand there, just attend to it every 15-20 minutes, skim the scum, and come back to it in another 15-20 minutes. Then add all other ingredients, except bay leaf and simmer for 6-7 hours. Once again, simmer, do not bring it to a rapid boil (rapid boil will result in a grey cloudy stock!). Walk by the simmering stock every couple of hours to skim (if necessary) and add some water, if needed, although I rarely do it as I want my stock to have more gelatinous body and reach flavor. After 6-7 hours of simmering the deep fragrant smell will invite you to check it out, and now you can add a bay leaf. The reason I add it in the end is because bay leaf can make your stock bitter in a very short time. Hence, add it in the end of cooking for 20-30 minutes and then discard it. Strain stock into another large pot, and refrigerate overnight. Next day remove solidified fat and store it in refrigerator for 2-3 days, or freeze for up to three months. Once again, I prefer to freeze it in a wide mouth glass jars. I tried different containers: BPA-free plastic, Ziploc bags, etc, and I can taste and smell plastic in my broth after de-frosting. 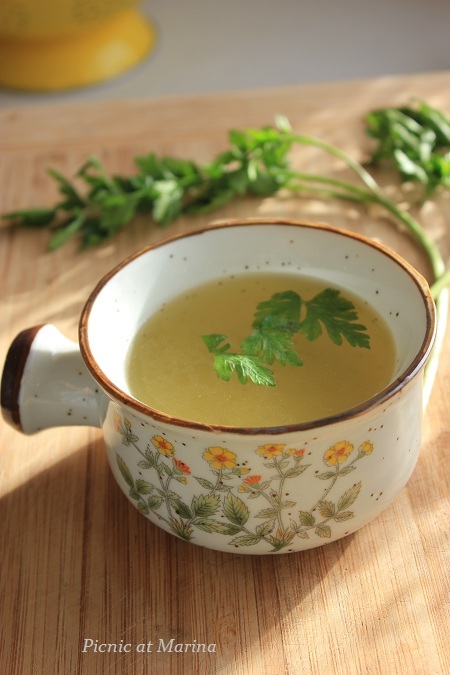 Now you can do with your broth/stock whatever you want: reduce it to make a velvety sauce, make a soup, cook some risotto, or just drink it plain with some fresh herbs and a little salt. The secret to any good stock is to cook it long and cook it slow. Add a dash of Love to it, and you would have a cup full of healing power and health benefits. Thank you Lorraine. So sorry to hear that you both are sick, I wish I could bring you some of it to heal. My husband is sick too, and I had to make chicken broth for him three times last week as that's only food he could have. Time consuming, yes, but what one wouldn't do for someone you love... :) Get well soon! I love having my own stock on hand. I agree with you, there is nothing better. I occasionally add a little rice and lemon juice for a nice flavorful bowl of soup. I love a simple broth...especially if I don't feel good. This sounds wonderful! Sweet hugs! Always have homemade broth/stock in the freezer. Agree, it is really easy to make and the rewards are huge. Norma, you are right: it is very easy to make. Although many people are intimidated by the process. Beautiful broth Marina, the color is perfect. I am also have homemade broth in my freezer. Different kind. I use it a lot for sauces or for soups. Thank you, my friend! Are you going to post the recipe for your broth? I have about 4-5 versions of broth in my freezer: mushroom, vegetables, brown chicken, white chicken, brown beef, and fish. Actually it makes it 6 this time. :) Love to have it handy! Thank you Lizzy for your kind comment. With my husband being under the weather I feel like I am operating a chicken broth company. Sometimes it is the only "medicine" your soul needs. Now that is dedication - 6-7 hours plus storing in glass. i am convinced though and will try to cook mine longer in future. I tend to only cook it for a couple of hours. I've never tried adding dill either and wil have to incorporate that as well. When the weather is colder, I even cook it longer: it makes a wonderfully flavored broth. Thanks for your comment, Liz! And by the way Marina, have you ever considered including e-mails feed option on your blog. In such a way I could be automatically informed about every single post on your blog and I would not miss a thing. How about that...? The Follow by e-mail works for posts, and it was all the way at the bottom of the page. I moved it to the top now, on the right, so you can subscribe! :) Thanks for letting me know, and thank you for being a good friend! Hope it works for you now. If you have any problems again, please, do let me know. Hi Marina - I don't think I ever ate stock just on its own before. I guess I wouldn't mind it at all if it had a little bit of potato, carrot in it, or maybe torn up pieces of dough, boiled in the broth... just on its own though, hmm - I'd have to try it I think before making up my mind about it. I know too well the benefits of a good stock though when making soups and other dishes! I bet the #3 stock tasted fantastic, although I'm sure they were all wonderful! Hi Charles, if you have not, please, do try some day. 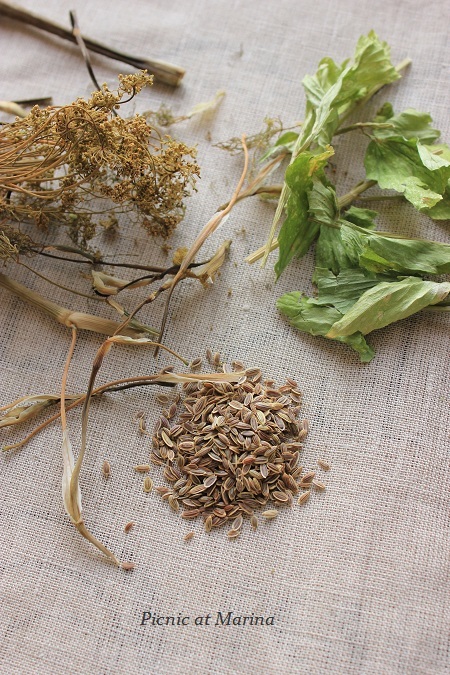 It has reach flavor, with a little salt (good salt) and a few parsley leaves it is a meal on it's own. Especially in the winter, cold winter. My husband was under the weather this week, and I had to make it three times for him as this was the only meal he could and wanted to eat. it has been raining all night and there were thunderstorms here in the morning , your post could not have come at a better time! Sawsan, thank you for your kind words. I guess a cup of warm chicken broth puts a smile on many faces, and warms up many souls. yes, that store bought stuff has no taste to me at all. What do they do with it?! You are absolutely right regarding the quality of the ingredients Marina! I love your stock and I wish I had a bowl right now that I am under the weather. 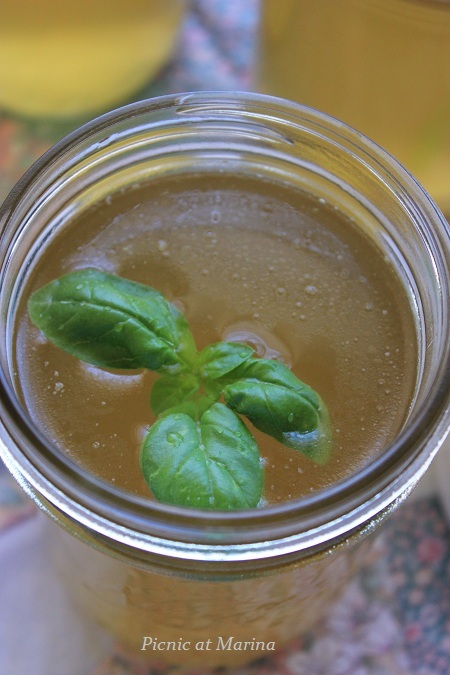 It's such a pleasure to read about other bloggers' ways to prepare chicken stock. Every single person makes it in a different way! Not to mention the country... 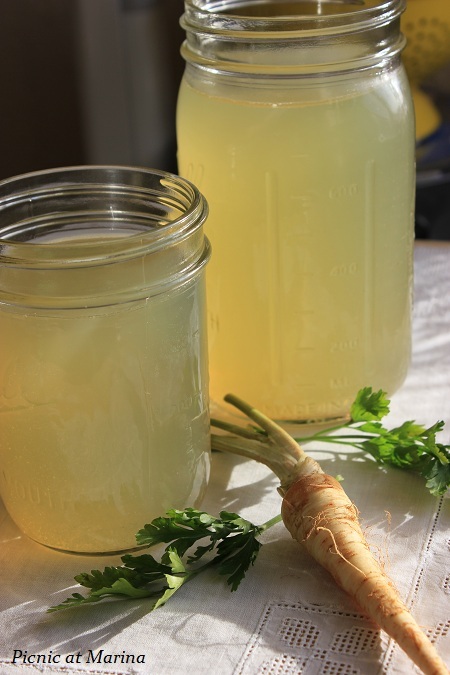 I prepare chicken stock constantly in winter (of course it's slightly different from yours). (I have now a new one, but haven't finished yet the one from last week). 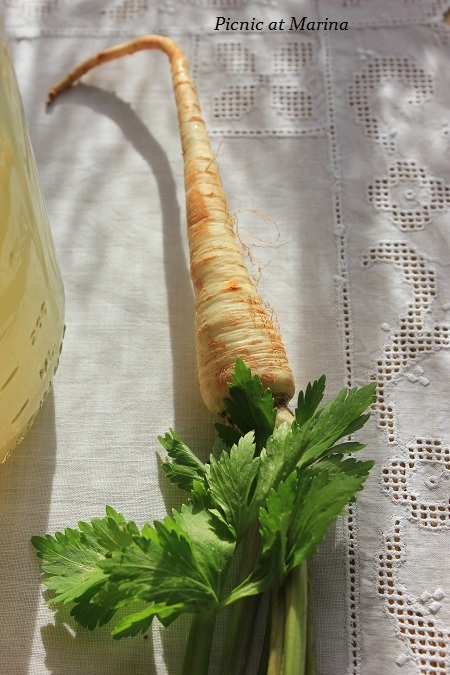 I am thrilled to learn you also use parsley root! When I don't have it, my stock is somehow sad :-( , so whenever I see it on the market, I freeze it or dry it. (It's not easy to get here). Stock as a soup brings back my childhood memories... I no longer do it. I always add some other ingredients, but I still love tasting my stock and appreciating how good it is. Great looking stock! I almost have some in the freezer. I usually make mine with fewer ingredients than you do, but I'll bet yours tastes better - I'll definitely have to try your version. Good stuff - thanks. Like the chicken stock...thanks for the recipe and sure this broth is very useful to have it handy in the freezer. That chicken stock looks delicious and warming!! How fabulous you got to make it previously with chicken from a local farmer. Hi Marina! Ohhhhh your chicken stock looks so good! I love looking at your ingredients list. What a good stock you make - such a precious flavorful broth... I love both of your soup bowls. Very cute! Hot Water Soup?...that is too funny! I love chicken broth, and always, have some in the freezer to combine it with vegetables, and/or making other dishes out of them. So many uses...endless list of them. Top on the list favorite of course, is making a nice RISOTTO with the homemade chicken stock. I love yours so much...reminds me of mine when I make it. I think you meant PEALED...instead of "pilled" carrots and parsnips? At any rate I knew what you meant; just a different spelling!